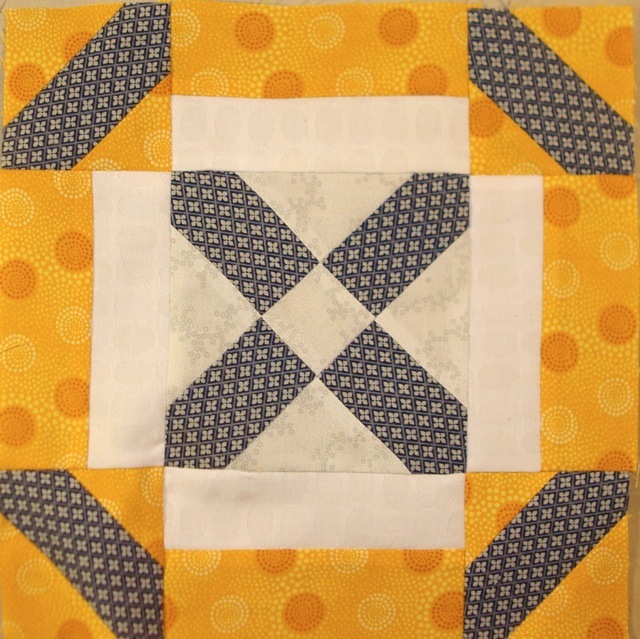 I have four blocks done on the Big Wheels quilt. I’m shooting for 12, so it’s a quarter done. So I lost track of time last week. While I was out and about I had some great ideas for topics to add to the blog, but, of course, I was driving and couldn’t write them down. Sadly, they are gone now. Maybe they will return, but I am not hopeful. As I might have mentioned while grumbling about how much of my yellow stash had been depleted by The Quilt That Shall Remain Nameless (which my friend, Cricket, has dubbed “Voldemort,” although I was thinking more along the lines of Rumpole of the Bailey,) that I had given myself carte blanche to acquire fabric until the end of February. The first 26 blocks from Grandmother’s Choice. Seeing them all together like this really brings home that they will need sashing. 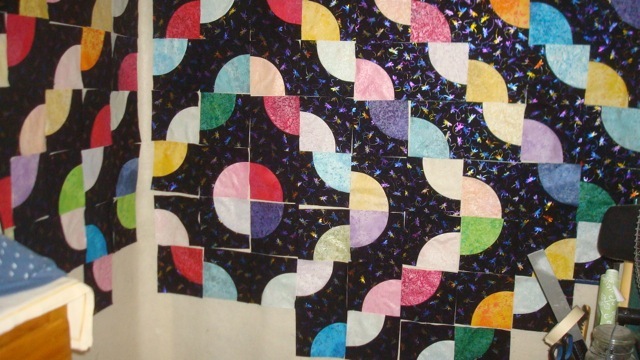 I went to three quilting stores (Red Barn in Merrimac, MA; Quilted Shamrock in Hudson, NH; and somewhere else that skips my mind at the moment.) I went to the Fabric Place Basement in Framingham, MA. And, finally, I went to my Guild’s UFO auction. Now, at the time I went to the UFO auction, I wasn’t actually planning on buying any more fabric, but I kept getting good deals and now I have no place to put my purchases. 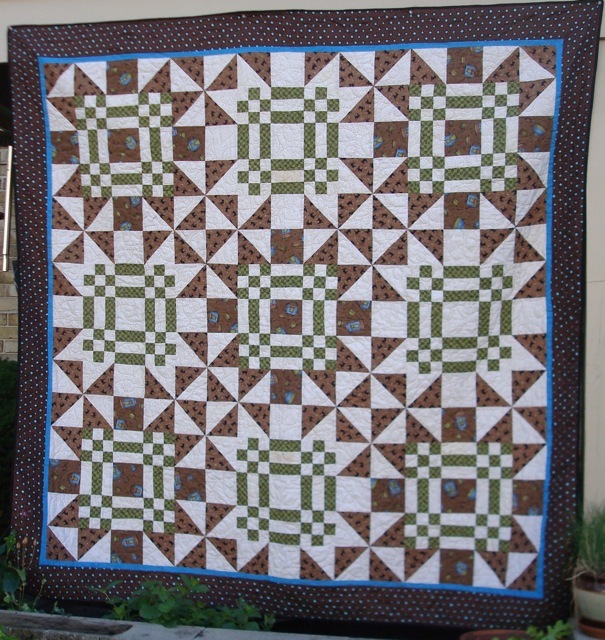 *sigh* I guess I must make more quilts! I have finally completed the fourth block of Big Wheels and have drafted (and begun cutting out) the fifth one. After having it less than a week, I finished my “Row Robin” box for the Guild. It was easy as soon as I figured out what I was going to do. 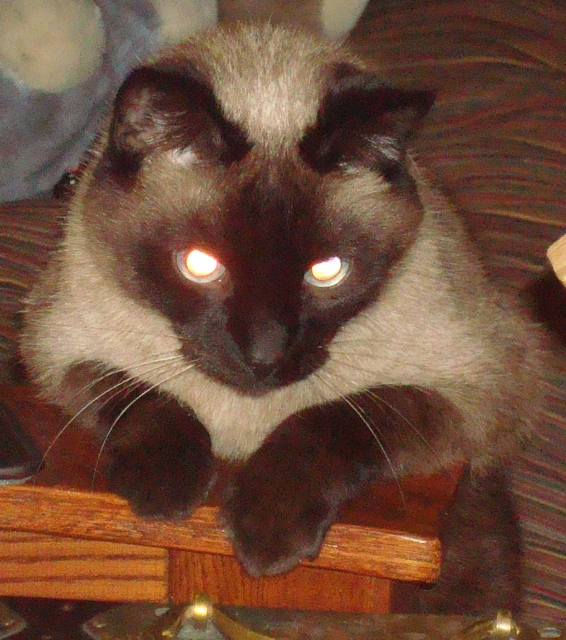 So, in other words, a much more productive week than the last time I blogged. 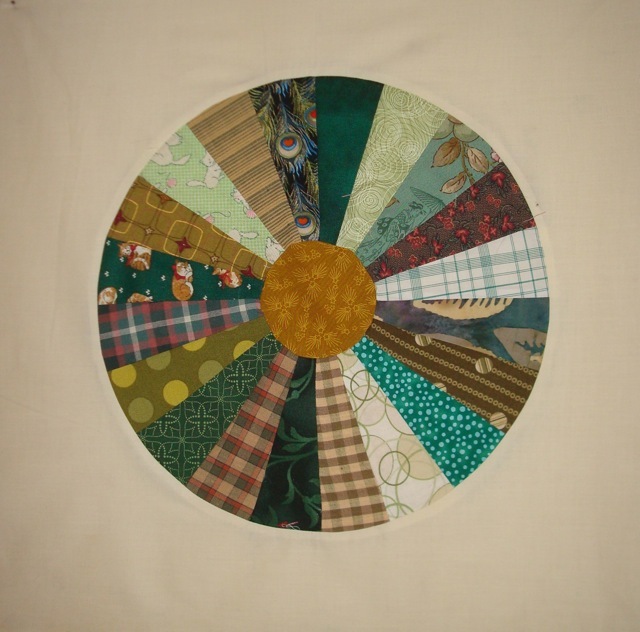 In other “news,” Drop and Give Me Twenty is done for the year, but I have found something else to keep me on track: The Scientific Quilter’s March-A-Long. On Friday, through Saturday, we’re supposed to have 18″-24″ of snow dumped on us by a Nor’easter named Nemo. I’m rather looking forward to it. It’s not that I’m a big fan of winter or snow, but since I don’t have to go anywhere and I don’t have to shovel anything (except to dig my car out afterwards), I’m cool with it. I was joking with some of my friends that I’ve been laying on additional fabric to ride out the storm, but, in truth, I had been itching to go to The Fabric Place for a while now. I have given myself carte blanche to buy whatever fabric I want to until the end of February, and then I fall back into only buying what I need to complete existing projects. So, what am I working on for Drop and Give Me 20? The second Big Wheels block will be a round “Bull’s Eye” block, which shouldn’t really take long. 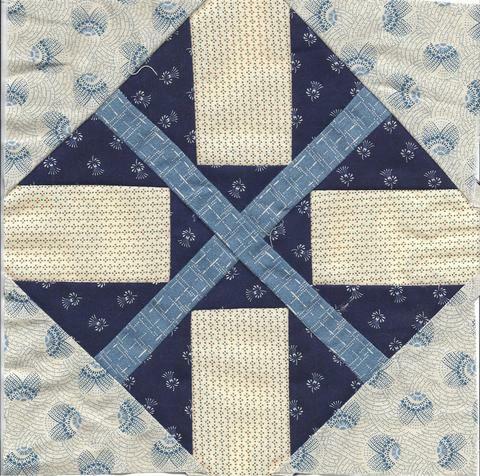 A new Grandmother’s Choice block will be posted on Saturday. I’m up to date, so I really don’t mind if I run a bit late with this one because of my trip. 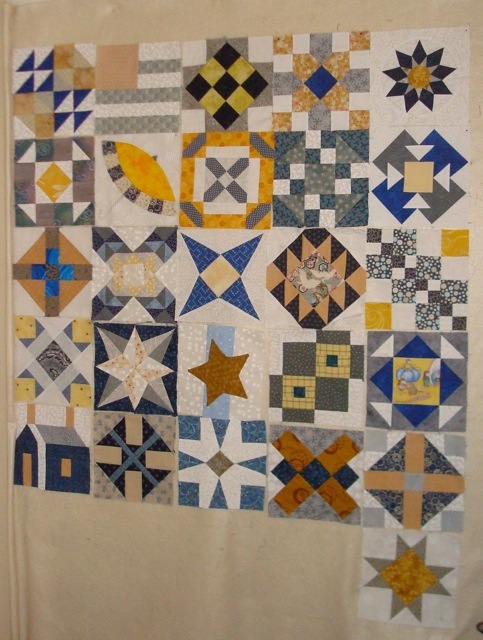 Prep Stars for Malcolm, this is the hand-piecing project I started in December. I will be traveling, so I hope I can finish another block while I’m in Pittsburgh. As you can see, my Orange Peel technique needs some work. The Orange Peels Project. 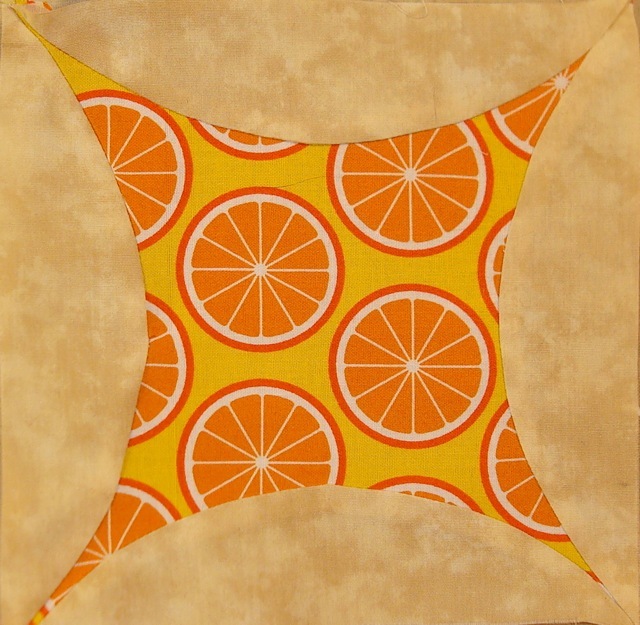 I have stumbled on a way to cut out Orange Peels blocks with the Cut Around Tool and I’m trying to “perfect” it. 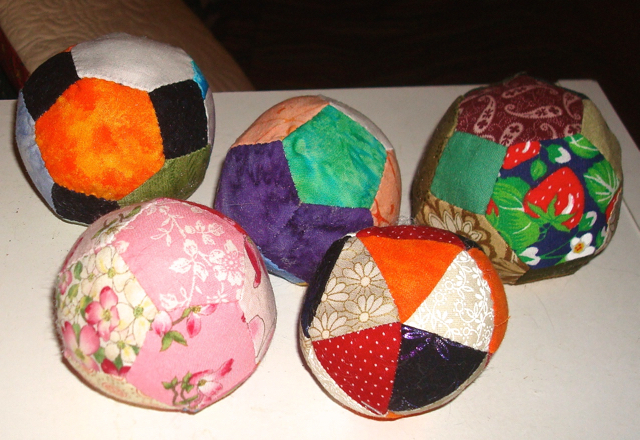 If you remember, I kind of object to “one trick wonder” tools because they tend to accumulate after I’ve made that one quilt that uses them. I can’t seem to get rid of them. 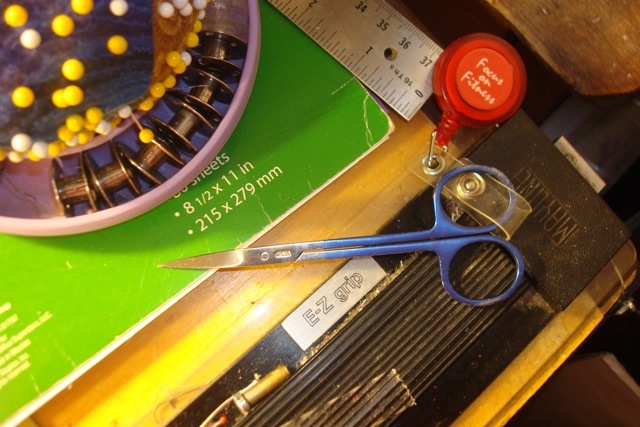 Well, I bought the Cut Around Tool because I just had so much fun with it in the class I took with Valerie, but it is a “one trick wonder” tool, so I’ve been trying to find new uses for it. I noticed that the sides of the Orange Peel block are arcs of a circle, and I decided to experiment to see if cutting out the blocks would be easier with the tool. It is, but I can’t really post a tutorial until my sewing of partial arcs improves. I guess I prefer to be wholly engaged during the making of a quilt. 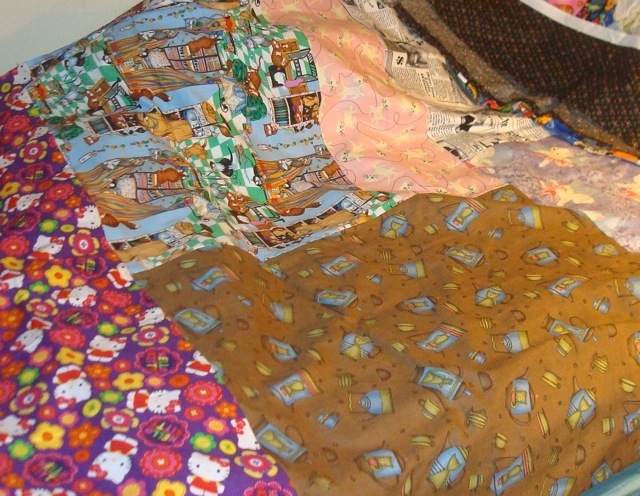 Going scrappy to me means choosing fabric combinations all through the quilt assembly process even if the sewing is rote. I guess I missed that. 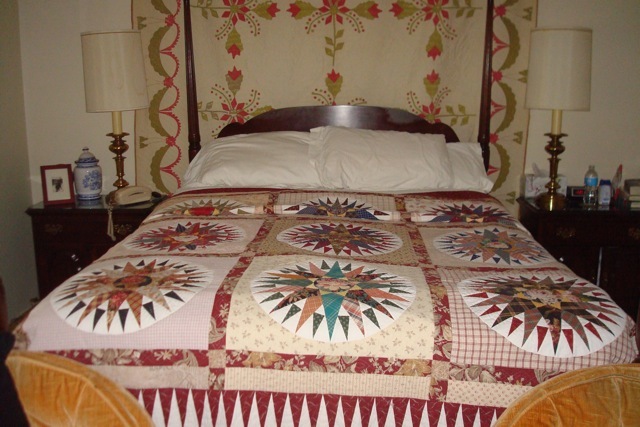 My mother’s Mariner’s Compass is on her bed with a vintage applique quilt she hung at the head of her bed. Hi all. Sorry no update last week, but I was in transit to visit my folks in Western Pennsylvania. However, I’m kind of a nervous traveler, especially when I’m not the one doing the flying myself. I brought lots of projects, but did very little on the trip itself. Barbara Brackman’s Grandmother’s Choice Kansas Sunflower block. 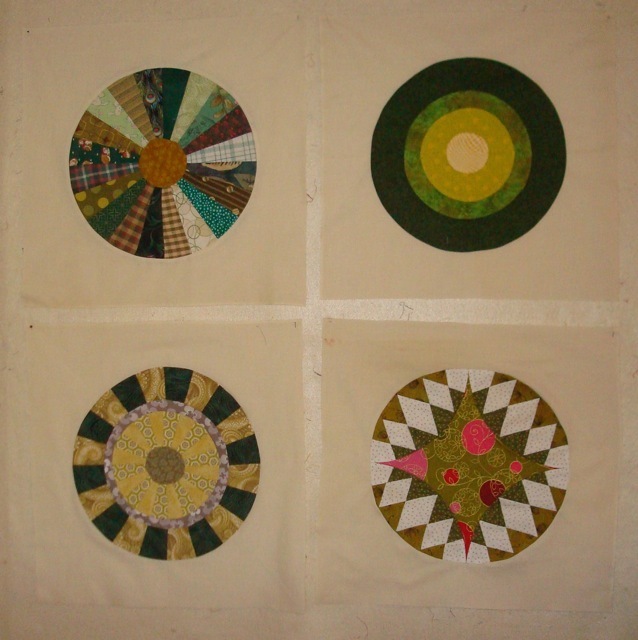 I did finish both Barbara Brackman’s Suffrage blocks while I was there. 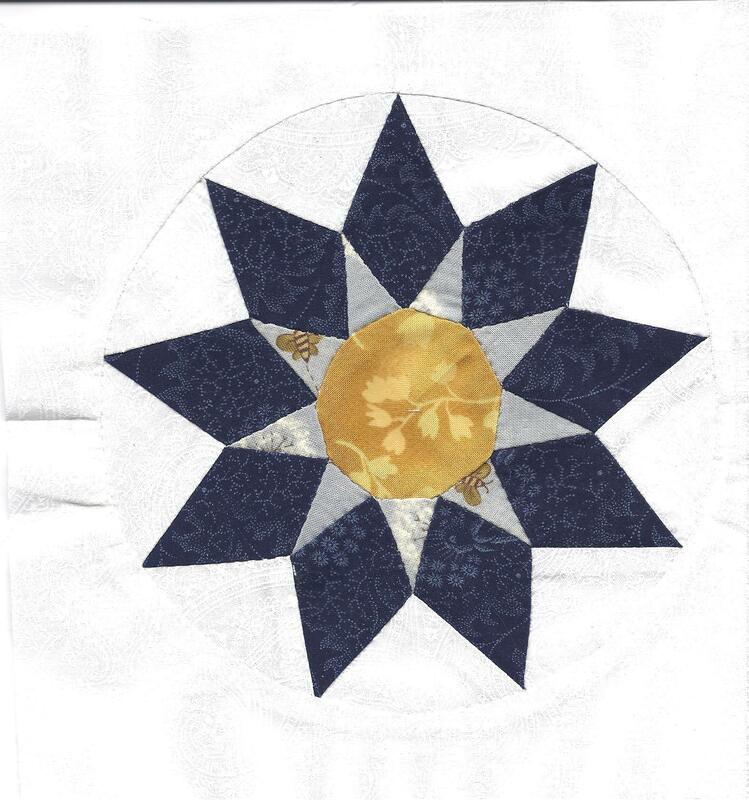 The first, the Sunflower block, I cut and marked for hand-piecing. I figured it was complex enough that I would probably have opted to hand-piece it even if I wasn’t traveling. I wasn’t happy with the center, though. Looking at it in person (instead of in this scan) the center is NOT round, but kind of a polygon. However, I don’t hate it enough to take it apart, especially since there are soooo many seams. Since I stayed over a Saturday, I got to piece the next block as well. 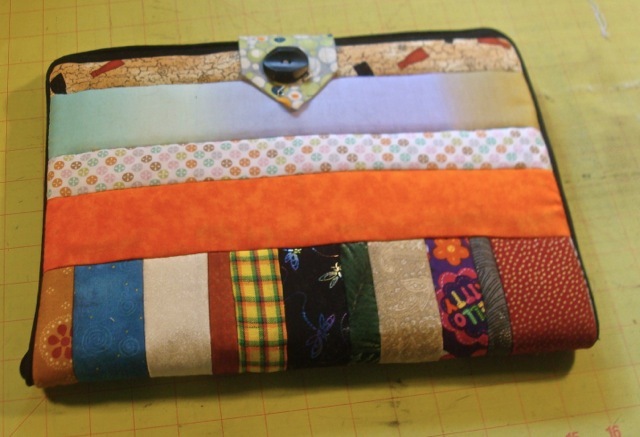 I used my mother’s fabric stash and her Bernina as well. Since I routinely switch between a Singer SewMate and a Singer Merritt, I never really thought I would have any trouble sewing on another machine, but, for some reason, I was a total klutz on the Bernina. 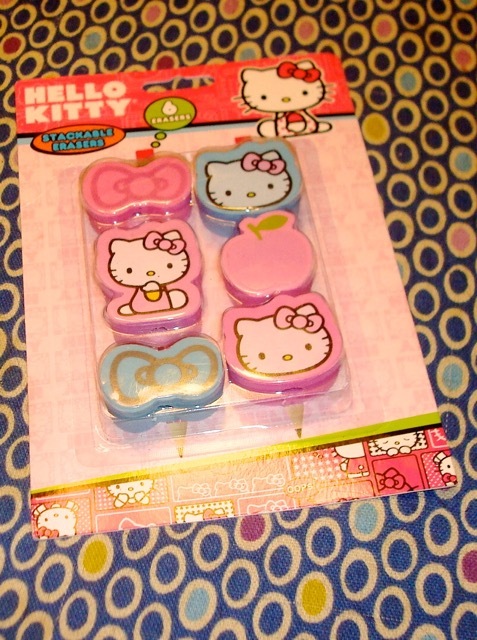 I couldn’t get a consistent seam line (let along a scant quarter-inch!) I know I will have to watch out for the corners when I put this block into the quilt since they are not consistently 1/4″ from the edges. 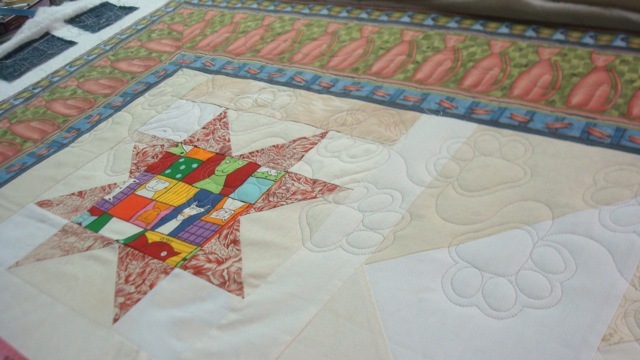 Mom’s quilt for Dad’s bed uses a “cheater” applique border for the outside. 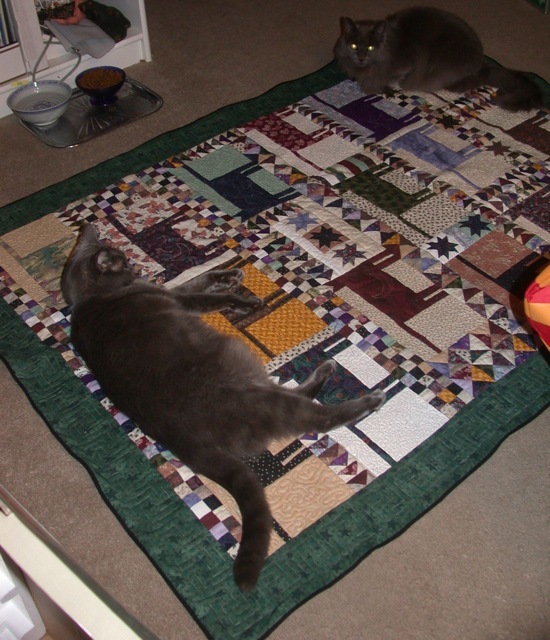 I took pictures of several of her quilts, although I didn’t dig very deeply into the closet. I think I’ll do that when I visit again in the Spring. 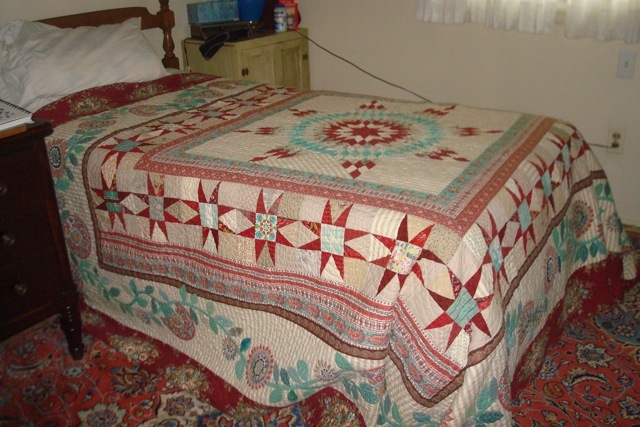 It’s nice getting the stories behind the quilts as well as the pictures. I did some computer instruction and tech writing so Mom can unload her camera herself instead of waiting for my brother or I (or even Dad…I guess he’s the last resort!) to do it for her. I think I even put a link to this blog for her. Maybe she’ll become one of my readers!